Roulette is a game with an aura of exclusivity, tradition and glamour. Yet, there’s no reason to be intimidated by the strange roulette terms or rituals. With our guide, you’ll learn to play online roulette like a pro in no time. There are plenty of pictures to show how everything works. What does roulette mean in English? What colour is 0 on a roulette wheel? What does 0 pay in roulette? What are the best roulette bets? What is a roulette ball made of? What is “no more bets” in French? 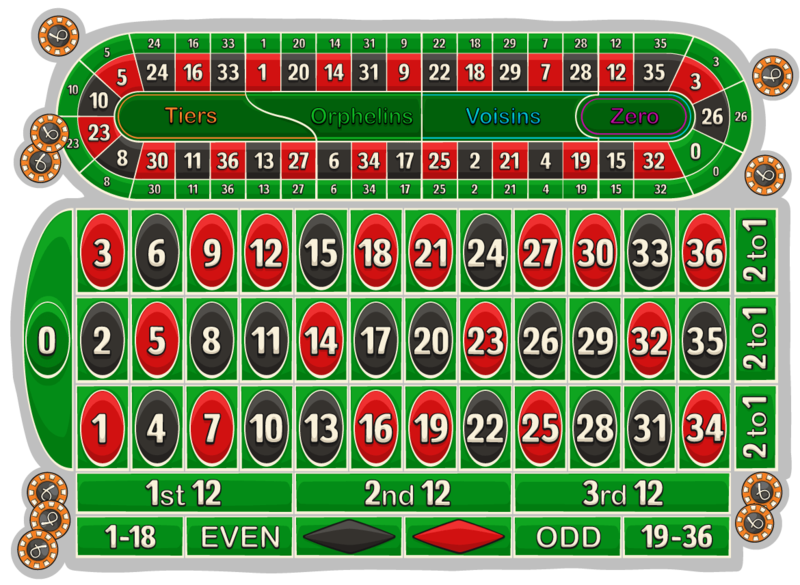 The players place their bets on individual numbers, ranging from 0 to 36 or groups of numbers, marked on the roulette table. The dealer spins the roulette wheel and launches a small ball going in the opposite direction on its outer rim. After this, he calls out “No more bets”. The ball slows down and falls into one of the numbered slots. This is the winning number. The dealer calls out the winning number and tells whether it is red or black, big or small, even or odd. Different bets have different payouts. If you bet on the winning number, you’ll get your money back 36-fold. By picking the correct colour, you’ll double your original wager. In roulette betting, there are different odds and payouts. They are based on how many numbers each individual bet covers. The less likely the outcome, the bigger the reward. The payout is usually expressed as a ratio of the payout to the original bet. Note that the payout is your net win for that bet - you will also get back your original bet. EXAMPLE: For a single number or “straight” bet, the payout is 35:1. If you bet £1 and win, you get £36 (£35 plus your original £1). Here’s a list of all roulette bet payouts and odds in European roulette. The detailed description of different types of bets can be found in the sections below. In American roulette, the payouts are the same, but the probability for a hit is lower. The roulette table is divided into two main sections. The numbers from 0 to 36 are laid out in a 3 by 12 grid with a zero on top. These form the inside bets. Outside the number grid, there are betting areas corresponding to different number groups, such as black and red. These are called outside bets. Some tables also feature the racetrack. It has all the numbers in the same order as they appear on the wheel. Roulette is a versatile game, which lets you place several different bets to suit your preferences. These fall into two main bet types: inside and outside bets. All the bets placed inside the numbered grid are called inside bets. In addition to the straight bet on a single number, there are several ways to bet on combinations of numbers within the grid. Street - chip placed on the outer edge of row covers 3 numbers. Payout 11:1. Corner - chip placed on the intersection of 4 numbers. Payout 8:1. Line - a chip placed between two streets covers 6 numbers. Payout 5:1. 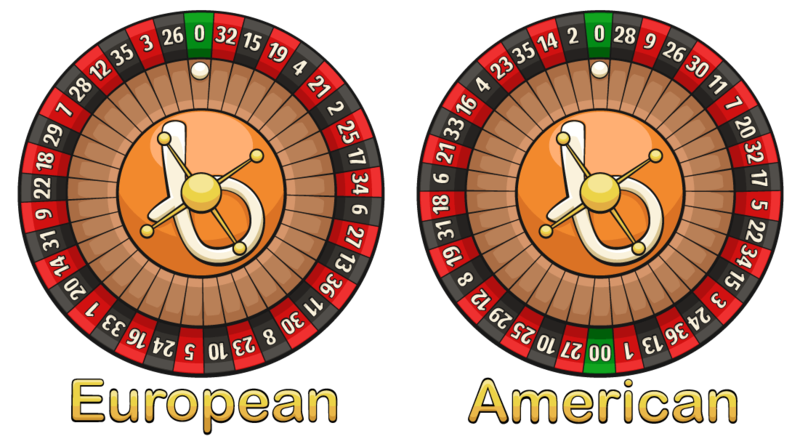 NOTE: A chip placed on the line between 0 and 1 covers 4 numbers (0, 1, 2, 3) in European roulette and 5 numbers (0, 00, 1, 2, 3) in American roulette. In the European version, the payout is 8:1, just like in any corner bet. In American roulette, though, the payout is 6:1. With the house edge of whopping 7.89%, this is by far the worst bet in roulette. Why use split bets instead of betting on single numbers? Split, street, corner and line bets allow you to target several numbers with a single chip. If you want to stick to the table minimum and make your stack last longer, covering a bigger portion of the table with fewer chips makes sense. Red & Black - the colour of the number pays 1:1. Big & Small - 1-18 are small numbers, 19-36 are big. Payout 1:1. Even & Odd - payout 1:1. Dozens - 1st, 2nd and 3rd dozen cover numbers 1-12, 13-24 and 25-36 respectively. Payout 2:1. Columns - The long lines of numbers covering 12 numbers each. Payout 2:1. Combining single numbers in split bets lets you cover extra space on the board for the same amount of money; outside bets allow you to take this even further. With more chips at your disposal, you can place more bets with ease and try out different combinations. For example, placing a black type bet online covers half the table with a single click. This is much easier, faster and cheaper than doing it one number at a time. In addition, you can try out different roulette strategies to make your game more interesting. NOTE: You can't target multiple outside bets with a single chip. For example, you can't place a chip on the border between Even and Red to play both of these bets. The race track is an ellipse-shaped area on the table. It features all the numbers in the order they appear on the wheel. All tables don’t have the race track. In some online roulette versions, you’ll need to select “show racetrack” from a game menu. The race track is divided into 4 sections with French names. They are classic call bets or announced bets. Each has a specific way the bet should be laid out on the table. Since some bets feature a mix of singles, splits, trios and corners, the payouts vary between different numbers included in each group. The term “call bets” means that some brick-and-mortar casinos let you state your intention verbally to the dealer, who will then accept your announced bet. In online roulette featuring the racetrack, it’s even easier: click on the bet name and the chips will be placed correctly. The neighbours bet includes all the numbers of the zero bet, plus 5 more numbers on each side: 22, 18, 29, 7, 28, 12, 35, 3, 26, 0, 32, 15, 19, 4, 21, 2 and 25. The thirds of the wheel bet covers 12 numbers opposite zero: 27, 13, 36, 11, 30, 8, 23, 10, 5, 24, 16 and 33. The orphans bet covers the 9 numbers not included in voisins and tiers bets: 1, 20, 14, 31, 9, 6, 34 and 17. Roulette tables always have house limits indicating the minimum and maximum bets allowed. In the same table, the limits are usually different for outside and inside bets. In brick-and-mortar casinos, outside bets have a higher minimum and maximum than the inside bets. Depending on the casino you visit and the table you choose, you may see e.g. a £1 minimum for inside bets, and a £10 minimum for outside bets. The table maximum typically ranges between 50 - 500 times the minimum bet. In online casino table games, the table minimum is usually the same for all bets. However, in live dealer roulette, table maximums may be lower for inside bets than the outside bets. This encourages placing bets with higher hit frequency but lower payouts, resulting in more predictable results for both players and casinos. Let’s start with European roulette, which is the simplest and most common variation available. The European wheel has 37 numbers, including the zero. Without the house edge, the payout on single numbers would be 36:1. Alas, it’s only 35:1. This means pays you 1:37 less, which equals 2.7% house edge or 97.3% return to player. Zero isn’t included in any outside bets: in roulette, zero is neither black or red, big or small, even or odd. In American roulette, 00 works exactly like 0. The double zero almost doubles the house edge for American roulette compared to the European version. The 5.26% house edge means 94.74% RTP. French roulette offers the smallest house edge available in roulette: 1.35%. This is achieved with a special “la partage” rule. When the ball stops on zero, half of all even money bets are returned. These bets with 1:1 payout include red/black, big/small, even/odd. EXAMPLE: You bet £2 on red and the ball stops on 0. You get back £1. Q: What does roulette mean in English? A: Roulette literally means "small wheel". In French, the wheel is 'la rouelle', and 'roulette' is the diminutive form of this noun. Q: What is the highest number on a roulette wheel? Q: How many numbers are there on a roulette wheel? A: European roulette has 37 numbers (1-36 and 0). American roulette wheels have an additional 00, bringing the total amount to 38. Q: What colour is 0 on a roulette wheel? A: Zero and double zero are both green. They are not part of any outside bet, including black and red. Q: What does 0 pay in roulette? A: In straight bets, 0 and 00 work as any other individual number and pay 35:1. The odds for hitting zero on a single spin are 1:36 in European roulette and 1:38 in American roulette, resulting in a 2.7% and 5.26% house edge respectively. Q: What are the best roulette bets? A: The odds are always the same for every bet, except for the zero line bet in American roulette, which is single-handedly the worst roulette bet. If you want more frequent hits, stick to bets that cover a larger portion of the table, i.e. outside bets. If you want bigger payouts, bet on single numbers. Q: What do all the numbers on a roulette wheel add up to? A: Adding together all the numbers between 1 and 36 results in 666, the number of the beast. A legend has it that Francois Blanc, the inventor of single-zero roulette, sold his soul to the devil in exchange of the secrets of the roulette wheel. A: The roulette wheel was accidentally invented by a 17th-century French mathematician Blaise Pascal. He was aiming to create a perpetual motion machine instead. The first description of roulette as we know it comes from Paris in 1796. However, games with a similar idea have been played for millennia. Q: What is a roulette ball made of? A: In the old days, roulette balls were fashioned out of ivory. However, ivory isn’t a very ethical or durable material by modern standards. Nowadays the roulette balls try to replicate the look and feel of ivory and are made out ofimg acetal, nylon, phenolic and Teflon. The most common roulette ball sizes are 3/4 inch and 5/8 inch. Q: What is “no more bets” in French? A: The dealers in French roulette tables may say “Rien ne va plus” (lit. nothing goes anymore) or “Les jeux sont faits” (lit. the bets are made). When urging the players to place their next bets, they’ll use the phrase “Faits vo jeux” (make your bets).